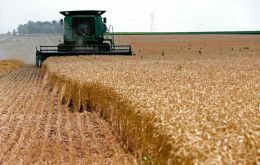 Argentine grain exports will total US$5.7 billion in the fourth quarter of the calendar year, the CIARA and CEC chambers promised on Wednesday, after seemingly successful negotiations with the government of President Cristina Fernandez that is eager to inject much-needed export dollars into the economy. 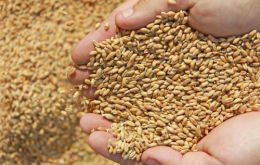 Food markets are more stable and prices for most agricultural commodities are sharply lower than they have been in recent years, according to the latest edition of FAO's biannual Food Outlook report and a new update to the Organization's monthly Food Price Index. Singapore based Olam International's wholly-owned subsidiary New Zealand Farming Systems Uruguay will be investing 80 million dollars to establish a new dairy processing facility in Uruguay. The European Commission opened Private Storage Aid for butter, Skimmed Milk Powder (SMP) and certain cheeses in order to alleviate the impact of Russian restrictions on imports of EU dairy products and to limit the negative effects on the internal market. Two Australian farmers from Tasmania have found what they hope to prove is the world's woolliest sheep. Peter Hazell said he had no trouble capturing the animal, which was wandering with its vision obscured by wool in scrubland on his property in Tasmania's Midlands on Sunday. 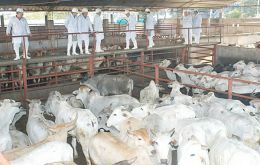 Paraguay has moved to eighth world exporter of beef and is planning to double the number of cattle slaughtered by 2020, according to the country's Rural Association, ARP. Last year 2.2million head of cattle were slaughtered in Paraguay, and 73% of the beef was exported while the rest was domestic consumption. Next Wednesday Uruguay's main agro-show at the Prado's greens will open to receive over 2.277 livestock among which will be selected the top cattle (meat and dairy), sheep (wool and lambs), horses and swine of the country, in a display of advanced genetics.